Virtual Machine is a completely separate individual operating system installation on your usual operating system. It is implemented by software emulation and hardware virtualization. Virtual machine is a software implementation of a physical machine - computer - that works and executes analogically to it. Virtual machines are divided in two categories based on their use and correspondence to real machine: system virtual machines and process virtual machines. First category provides a complete system platform that executes complete operating system, second one will run a single program. Frequently multiple virtual machines with their own OS's are used in server consolidation, where different services are run in separate virtual environments, but on the same physical machine. Virtual machine is not that efficient as a real one when accessing the hardware. Virtualization brings you a number of advantages – centralizing network management, reducing dependency on additional hardware and software, etc. But as it is always the case, it has certain shortcomings too. There are a lot of cases when the virtualization software struggles to provide full and reliable forwarding of USB and serial devices to the virtual environment (e.g. VMWare, ESX, Microsoft Hyper-V). Or the appliance can be accessed from the virtual machine but it may not function properly. How to deal with that situation? When accessing a USB or serial device from a virtual machine becomes a problem, USB Network Gate and Serial over Ethernet Connector come to rescue. Thanks to their port redirection technology, the dedicated programs allow forwarding USB and serial peripherals over network to virtual environments (VMWare, ESX, Microsoft Hyper-V, etc.). With the software you will be able to access a USB or serial device from your guest OS, even if the device is not plugged into the host OS but connected to a remote PC. Serial Port Redirector (aka Serial to Ethernet Connector from Eltima) allows transferring serial-port data to a guest OS of a virtual machine and is among the most efficient ways to redirect serial data to the virtual environment. The software allows providing any system with an unlimited number of virtual serial interfaces. A virtual COM port created with the help of the software behaves exactly like a real port and mirrors all the activities of a physical COM port. This allows connecting local serial devices to Hyper-V, VMware, Xendesktop, VirtualBox etc. hypervisors over any distance. Serial to Ethernet Connector can be used with such operating systems: Windows and Linux. Firstly, download Serial to Ethernet Connector. Then install the software on the host machine with the connected COM port device and on the guest OS. Once installed, start the Serial to Ethernet program on the host PC, start the app and choose “Server connection”. 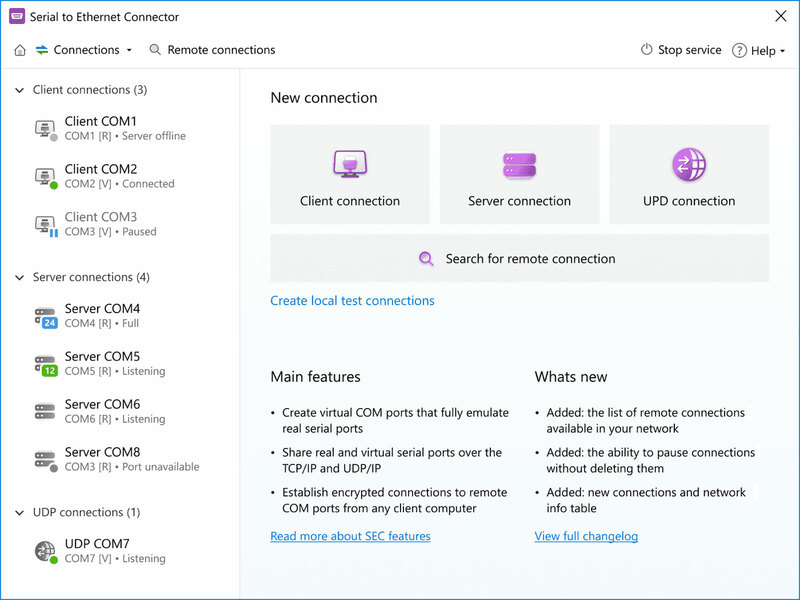 Configure the connection settings and click “Create connection” to open the port with the device attached. On a virtual machine, choose “Client connection”. Enter the server’s IP address as well as the name of the open serial port and click “Connect”. That’s it! Now, you can access the required COM port device from a virtual machine easily and effortlessly. Considering that many virtualization apps offer limited or no support for local USB devices, the software solution, USB over Ethernet Connector, seems to be a real sigh of relief for many users. USB Network Gate allows you to attach a USB device to a guest OS running on Virtual Server. Thanks to its USB redirection technology, the dedicated program allows forwarding USB peripherals over LAN or the Internet. With the software you will be able to access a USB device from your guest OS, even if the device is not plugged into the host OS but connected to a remote PC. How can you do it, you would ask? Install the application on the host OS of a computer in your network. 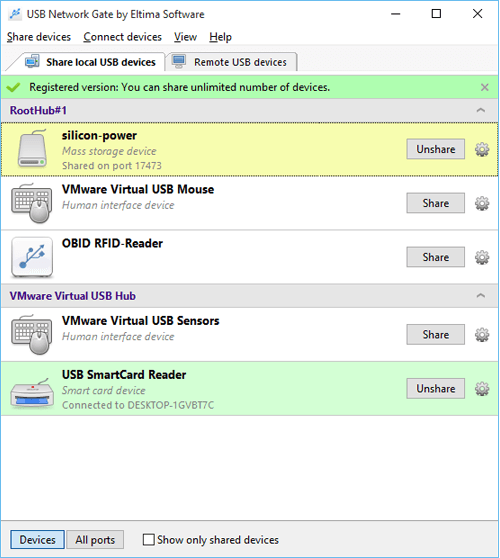 Share access to a USB device attached to it. Then install USB Network Gate on the guest OS of the computer that needs to access the device. The application allows USB passthrough to the guest OS running on Virtual Server, i.e. you can connect to the shared device. The OS will see the device as a real one and it will allow you to use it as it were connected directly to your machine. Additional advantage of the software is that it works across multiple platforms. USB Network Gate supports Windows, Linux, and Mac operating systems.